Preheat oven to 300 °F. Spray a 9-inch springform pan with nonstick cooking spray. In a food processor, turn cookies into a very fine crumb; you should have about 3 ½ cups. Put crumbs in a small bowl. Pour melted butter over crumbs and mix with a spatula until well combined. Press crumb mixture into bottom and sides of prepared pan, leaving about ½ inch between top of crust and top of pan. Smooth evenly with the back of a spoon. Let crust set in freezer for 10 minutes. Bake in oven for about 10 minutes. Cool. Increase oven temperature to 350 °F. Over a double boiler, melt butter and chocolate together. Set aside to cool. In a small bowl, whisk together espresso powder, coffee, salt, and vanilla. Set aside. In the bowl of a standing mixer fitted with a whisk attachment, beat the egg yolks with 1/2 cup of the sugar until mixture is light and almost doubled in volume, about 5 minutes. Add chocolate mixture and beat until just combined. Scrape down sides and bottom of bowl; mix on low for 5 seconds. Add coffee mixture and beat until just combined. Scrape down sides and bottom of bowl; mix on low for 5 seconds. In a clean bowl with a whisk attachment or electric mixer, beat the egg whites until foamy. Gradually increase speed to high and add remaining ½ cup sugar, beating until soft peaks form. Scoop 1 cup of the egg whites into chocolate mixture. Use a rubber spatula to gently fold in egg whites. After about 30 seconds of folding, add remaining egg whites and continue folding until almost completely combined; work gently and do not overmix. Pour batter onto cooled cookie crust and bake for 38 to 42 minutes or until cake is set but still jiggles slightly; it may not appear to be completely cooked. Allow to cool completely. Cake will deflate in center and look sunken as it cools. Tightly wrap and refrigerate cake for at least 3 hours or overnight. In a medium saucepan, whisk together sugar, cocoa powder, cornstarch, and salt. Add egg yolks and whisk until combined. Whisking constantly, slowly pour in milk. In a saucepan over medium heat, bring mixture to a boil, whisking constantly to prevent burning. Boil for 30 seconds; transfer mixture to a medium bowl. Add butter, vanilla, and chocolate; whisk until combined. Continue whisking for a few more minutes to slightly cool mixture. Let pudding stand for 15 minutes at room temperature. Press a piece of plastic wrap directly onto pudding’s surface to prevent a skin from forming. Chill for at least 3 hours. Stir pudding, then pour it on top of cake, staying inside crust border. Use a spatula to spread pudding into an even layer. 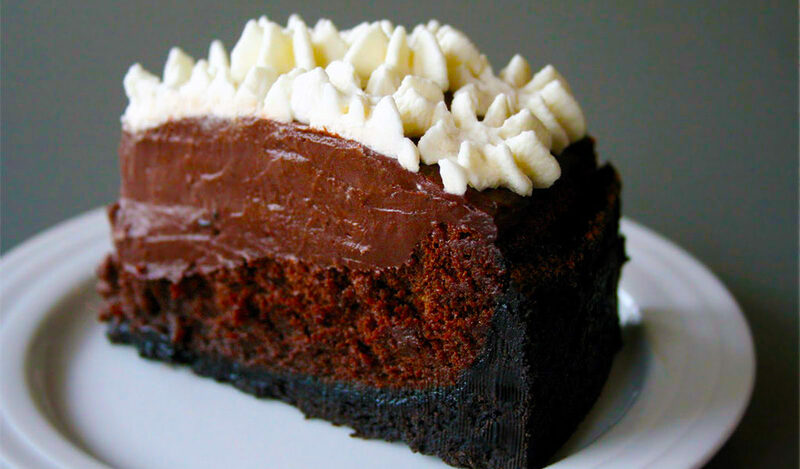 Return mud pie to refrigerator for at least 30 minutes. Decorate with whipped cream if desired. Love it. Pinning for special occasions !